Meridian LDS Temple — The Land Group, Inc. 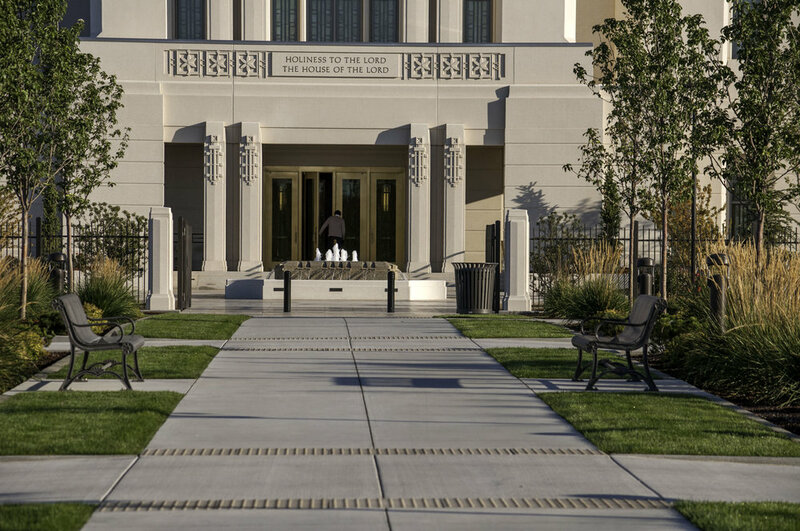 The Land Group worked with the project client to bring a new LDS Temple to life. The two ponds on site act as aesthetically pleasing landscape features, and they help keep the site properly irrigated. The Land Group's work on this project started in 2011; providing the overall site master planning, including services for the site entitlement process, site annexation and rezoning, major Meridian Road street improvements, site surveying, civil engineering, landscape architecture, site construction administration, and site maintenance. The 12 acre site included a location for the Temple and Meetinghouse buildings, in conjunction with parking lot layout, maintenance structure, two ponds, and extensive landscape and site details. The services also included complete site grading and drainage plan, sewer, water and complete infrastructures. Extensive collaboration with the client and contractor resulted in creative solutions to changing needs on site. This team effort is epitomized by the Temple Site Management Plan created by The Land Group and others to assist the client in maintaining this beautiful landscape for years to come.